Established in 1989, from modest beginnings, Keyes Transport is now one of the strongest independent transport companies in Essex, running twelve lorries. As well as the many Essex based companies that Keyes Transport provide their services to on a daily basis, they also have a contract with national company Pallet-Track, covering all of their work in the CM area. 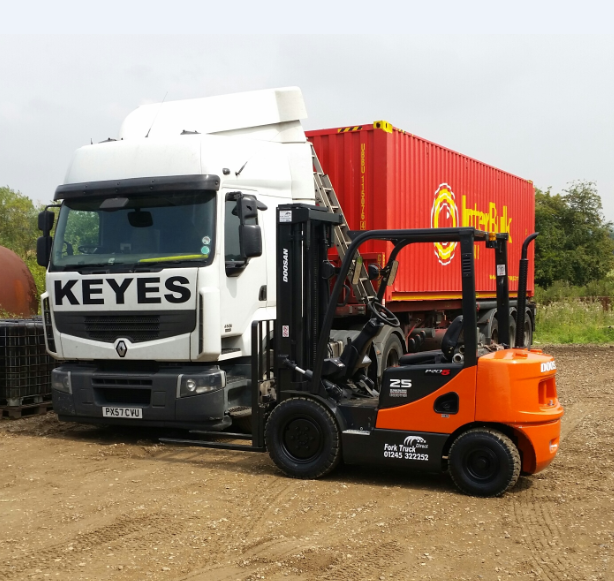 Earlier this year, Peter Keyes, MD of Keyes Transport, decided that he needed an extra truck at their site in Great Totham to help cope with the increase in business since the turn of the year, and so turned to Fork Truck Direct. Mike Dixon of FTD carried out a site survey and he and Peter decided the best option would be a fully refurbished 2.5 tonne diesel with pneumatic foam filled tyres. The workshop engineers carried out a full refurb on a Doosan D25S-5 diesel truck and as you can see from the picture above (after it had a visit to our new fully equipped paint shop) the truck looked as good as new on delivery! Peter was extremely pleased with the high standard of the refurbishment and actually called Mike a couple of days after the truck was delivered to let him know how fantastic the ride quality of the new (refurbished) truck was – especially in comparison with previous trucks he’d had on site. The smooth ride is attributed to the special foam filled tyres (that FTD’s Director, Mike Dixon, recommended he have fitted) which make a huge difference when driving across bumpy or uneven ground.